Fresh components. 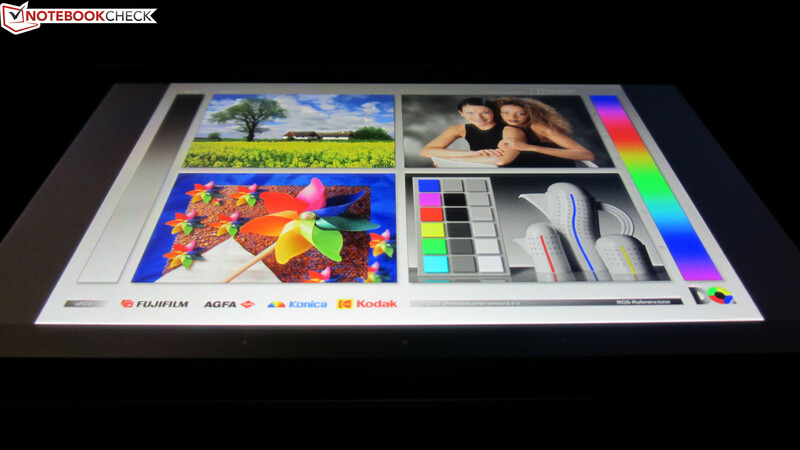 The Memo Pad HD 7 ME176C is the successor of the Memo Pad HD 7. Asus equipped the new version of its 7-inch tablet for 200 Euros (~$269) with a more powerful quad-core SoC as well as the latest Android version. 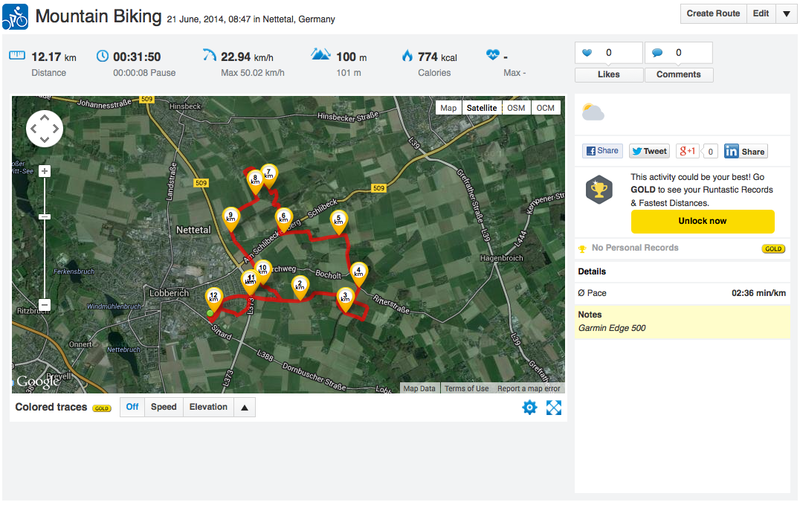 Our review shows if the fine-tuning was successful. 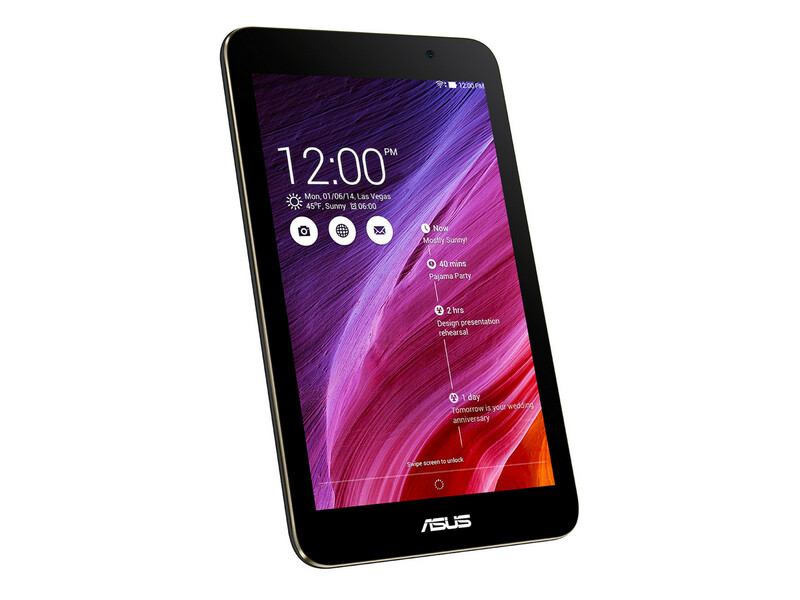 Asus offers an update of the Memo Pad HD 7 with the new Memo Pad HD 7 ME176C and follows its retail philosophy: The 7-inch tablet once again, only costs around 200 Euros (~$269) and uses a fast quad-core processor. However, the Memo Pad HD 7 ME176C is equipped with the Intel Atom Z3745, which offers more performance and is more frugal at the same time compared to the Mediatek MT8125 from the predecessor. Asus also reworked the case that is now slightly lighter and thinner. Four CPU cores, 200 Euros: The Asus Memo Pad HD 7 ME176C. Asus equipped the Memo Pad HD 7 ME176C with a case that is completely made of plastic, which is not really surprising when you consider the low price of around 200 Euros (~$269). Still, you get quite a lot for your money: The Memo Pad HD 7 ME176C is available in black, white, yellow, blue as well as red, and is well built, provides convenient haptics thanks to the slightly rubberized back and is comparatively light weighing almost 300 grams (~10.6 oz). Compared to the Asus Memo Pad HD 7, the new Pad HD 7 ME176C is just slightly lighter, but also noticeably thinner by 1.2 millimeters with a height of 9.6 millimeters (~0.38 inches). 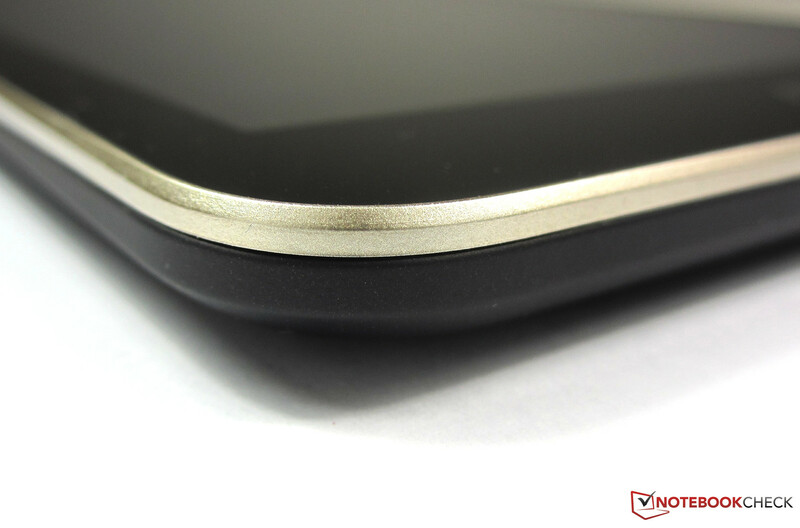 On a similar level is the 7-inch rival Samsung Galaxy Tab 3 7.0 SM-T210 measuring 9.9 millimeters (~0.39 in), whereas the Google Nexus 7 2013 is significantly thinner measuring 8.65 millimeters (~0.34 in). The new version of the Memo Pad HD 7 once again uses a quad-core SoC, but instead of the Mediatek MT8125, Asus equipped the new Memo Pad HD 7 MC176C with the more efficient and also significantly faster Intel Atom Z3745 with four cores clocked at 1.33 GHz. The SoC provides the integrated Intel HD Graphics based on Intel's Bay Trail platform, which belongs to the lower high-end segment. Both chips are supported by 1 GB memory. 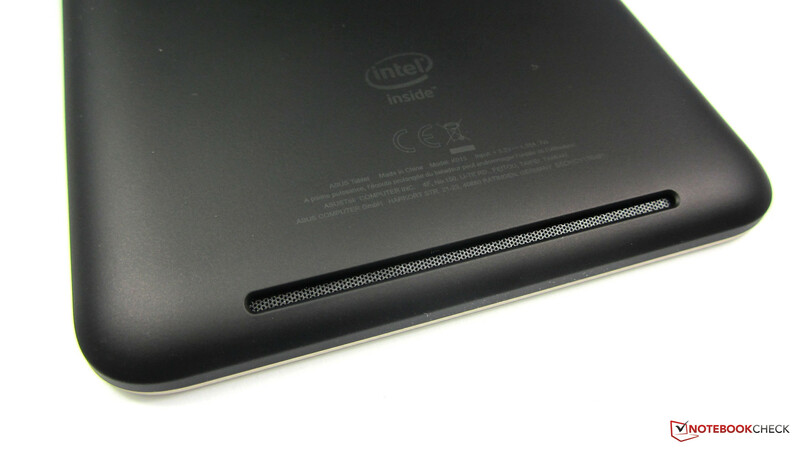 Besides our review unit with 16 GB storage, the tablet is also available with 8 GB. 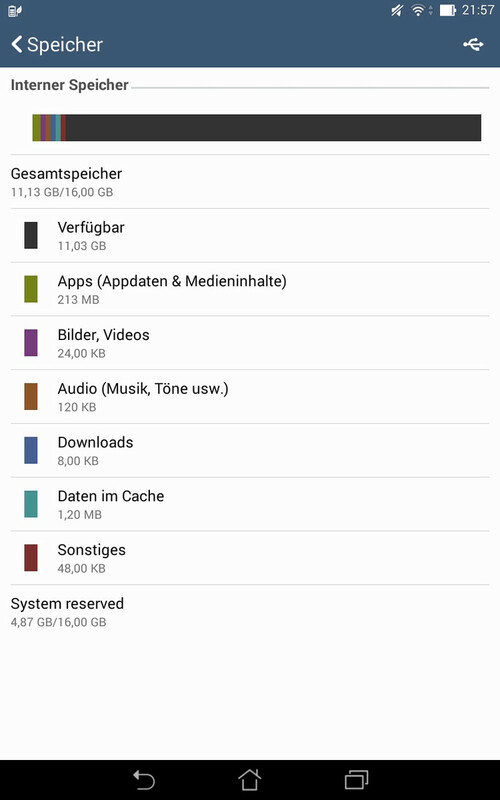 The preinstalled Android 4.2.2 and the preloaded apps occupy almost 5 GB, so the user can use around 11 GB for files and apps when they get the 16 GB version. The Memo Pad HD 7 ME176C has a micro SD card slot and you can expand the storage by up to 64 GB. 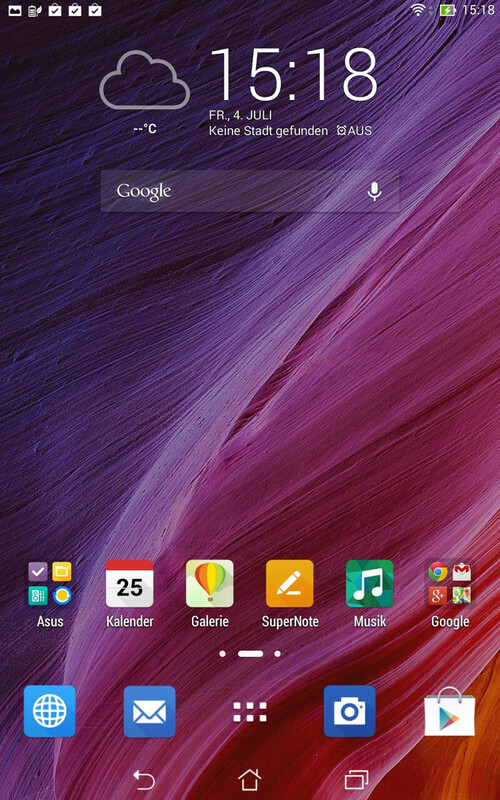 The operating system of the Memo Pad HD 7 ME176C is Android 4.4.2 and Asus included several apps. You obviously get some standard tools like the Play Store, Facebook and Google Maps, but also several apps from the manufacturer. For example, an assistant to save power, the task manager Do It Later and Asus Webstorage that includes 5 GB of Asus Cloud Storage for free. 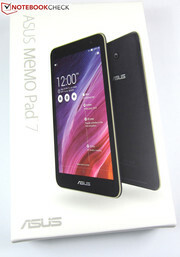 Asus also equipped the Memo Pad HD 7 ME176C with a user interface called ZenUI, which is fortunately not too different from the stock Android experience. ZenUI allows the adjustment of the menu surfaces, so that the home screen informs about upcoming calendar events or the latest activities in social networks, for instance. 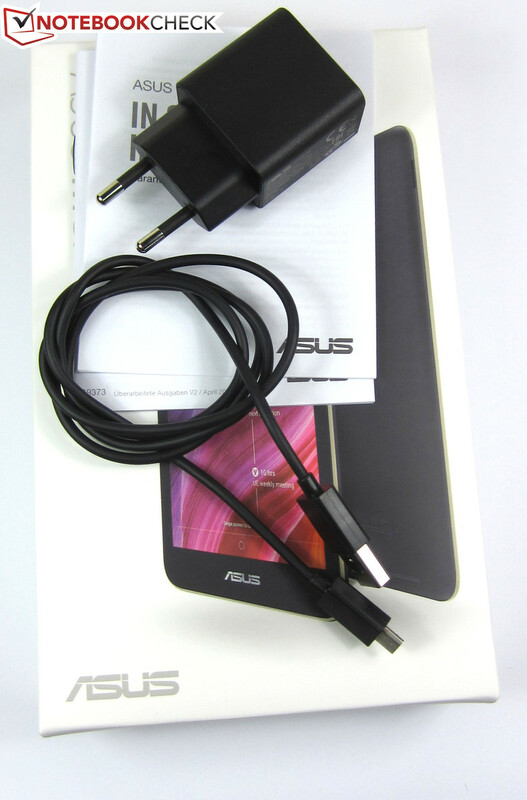 Buyers of the Asus Memo Pad HD 7 ME176C have to waive 2G or 3G connectivity, just like fast Internet connections via LTE. The tablet supports the WLAN standards 802.11 b/g/n in return; the performance was stable and the range was good during our review. You also get Bluetooth 4.0. 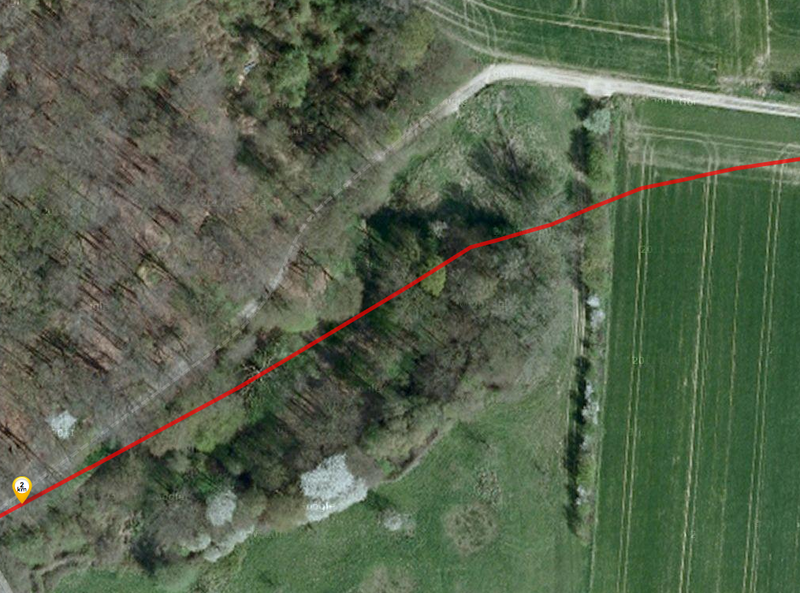 The GPS and the GLONASS module enable a fast location of the position both outdoors and indoors. 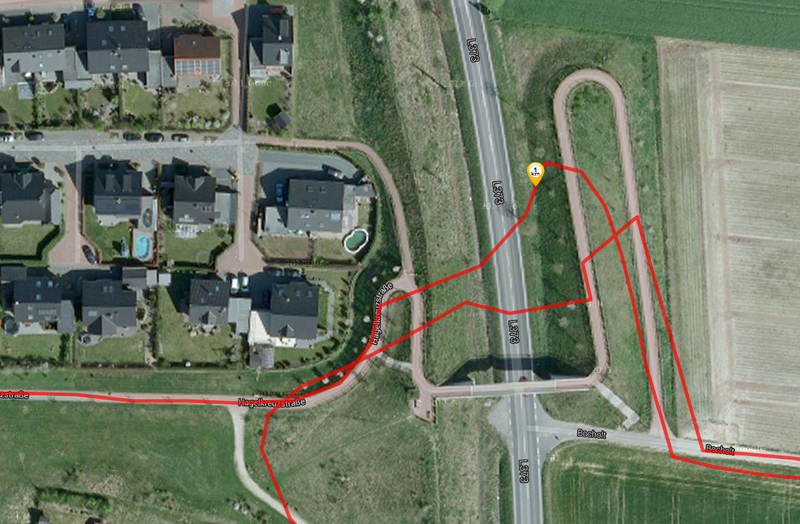 The Memo Pad HD 7 ME176C can obviously not keep up with a professional navigation device like the Garmin Edge 500. 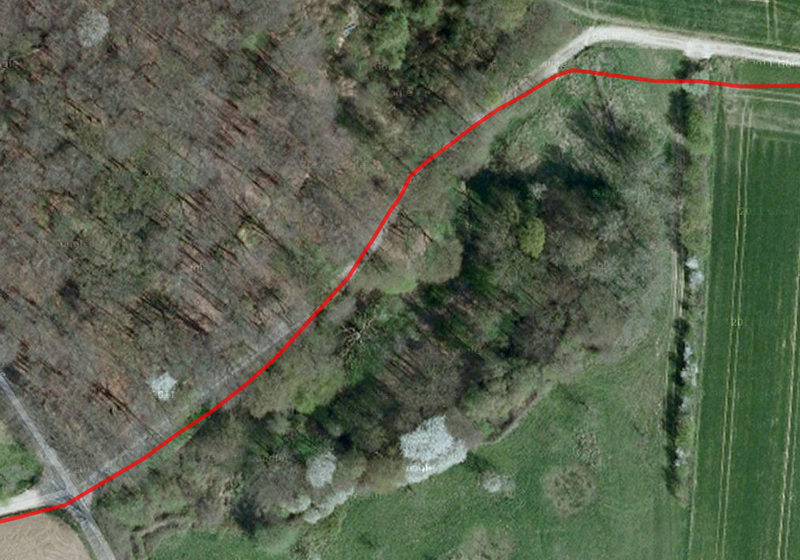 The roughly 10 kilometers (~6.2 miles) long bike ride shows some deviations of the tablet in the narrower sections and the forest. 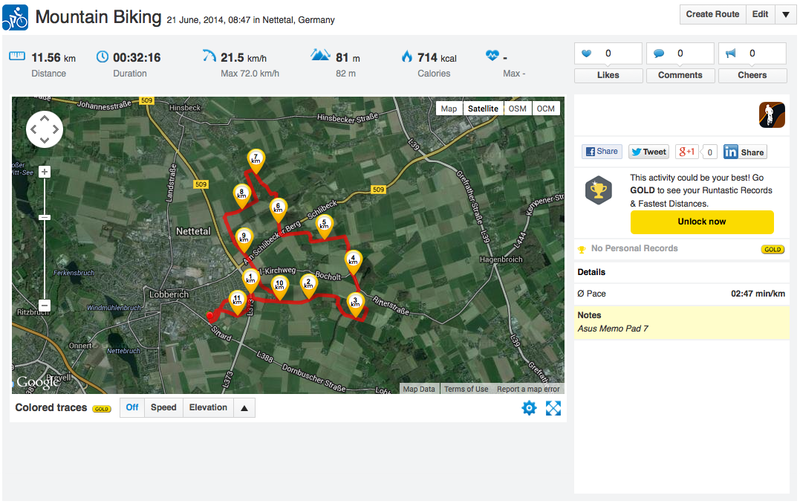 However, the accuracy of the Asus GPS is more than sufficient for common tasks. 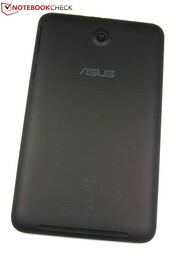 The Asus Memo Pad HD 7 ME176C has a 5 MP main camera, which takes pictures with up to 2560x1920 pixels in a 4:3 aspect ratio. 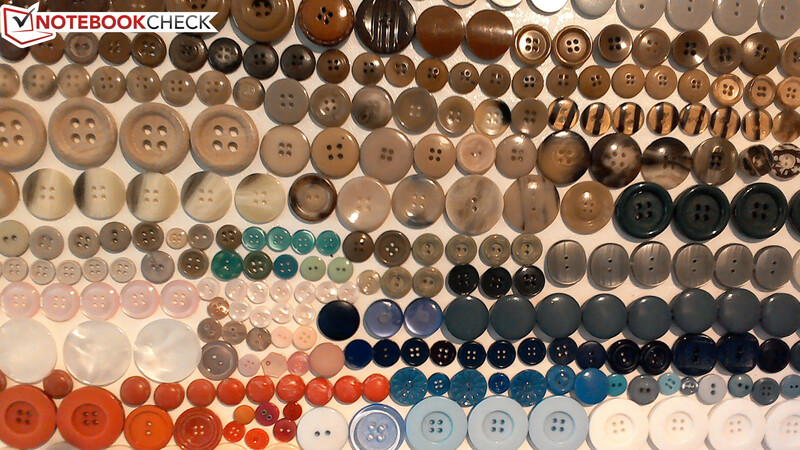 The tablet can also take pictures in 16:9, but only with 4 MP (2560x1440 pixels). Videos can be recorded in 1080p (1920x1080 pixels) with 30 frames per second. 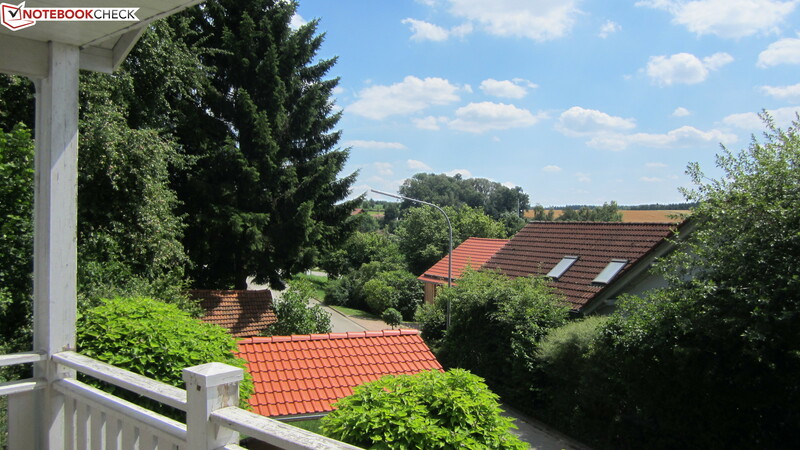 A webcam is located on the right side above the display and uses a comparatively high-resolution 2 MP sensor (1600x1200 pixels). 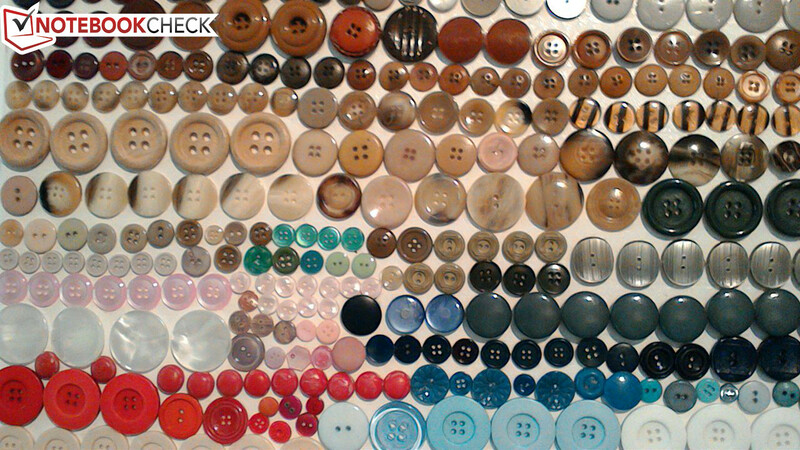 The Asus tablet leaves a mixed impression when we look at the picture results. We liked the numerous camera settings of the Memo Pad HD 7 ME176C, which can be adjusted manually, for example the white balance, the ISO number and the exposure. 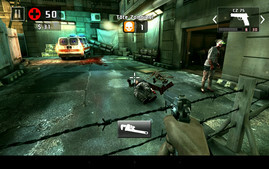 You also get an anti-blur feature, facial recognition as well as several camera modes like HDR, panorama and night shot. A flash, however, is not available. We have to disappoint you if you hoped that many settings also indicate a good tablet camera. The picture quality of the Asus tablet is easily sufficient for snapshots, but it is, similar to the predecessor Asus Memo Pad HD 7, average at best. You do not have to look too closely to see blur, color fringes and sometimes washed-out structures on the pictures. Asus delivers the Memo Pad HD 7 ME176C with a micro USB cable, USB power supply as well as a quick start guide. Other accessories like headphones are not available on the website of the manufacturer. The tablet comes with a warranty of 24 months. 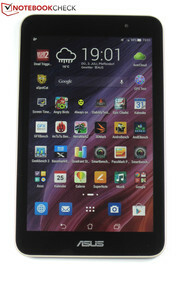 The handling of the Asus Memo Pad HD 7 ME176C is attractive thanks to the quick and precise 10-point touchscreen. The feeling that you are working with a fast tablet is even enhanced by the quick automatic display rotation, which changes to the corresponding mode after a surprisingly short delay. 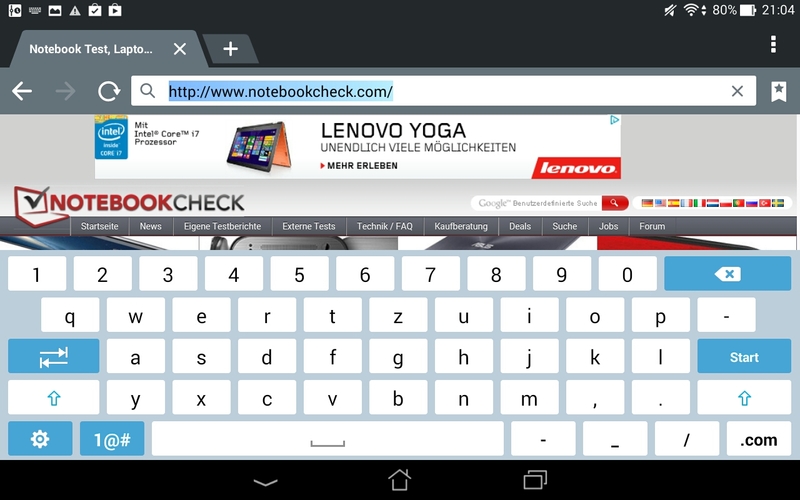 The good handling benefits from the handy on-screen keyboard with its well-dimensioned keys as well. Above the letter keys is an additional row with the numbers 0 up to 9, so there is no annoying switching between characters and numbers. You might think that the additional row also occupies more space, but that is not the case. 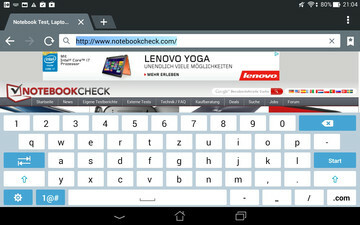 The virtual keyboard occupies around a third of the screen in portrait mode and around the half in landscape mode. 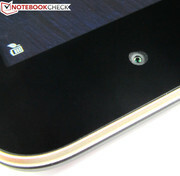 The 7-inch IPS display of the Memo Pad HD 7 ME176C has a resolution of 1280x800 pixels, which is similar to the Memo Pad HD 7. All the other specifications of the two displays are very similar as well, so we can repeat the display verdict of the predecessor: Asus does not equip the Memo Pad HD 7 ME176C with a high-end panel, but uses a comparatively good IPS panel that can convince in the important areas. With an average brightness of 353.4 cd/m², the screen of the Asus is sufficiently bright for outdoor activities. However, the displays of the Google Nexus 7 2013 (513.4 cd/m²) and the Samsung Galaxy Tab 3 7.0 SM-T210 (426.6 cd/m²) are even brighter, whereas the LG G Pad 8.3 is in last place within our comparison with a luminance of 291.7 cd/m². 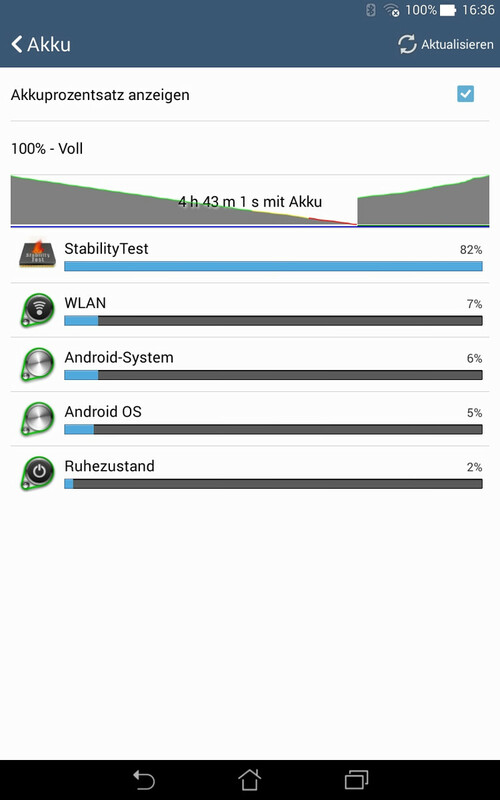 The Asus tablet has a pretty even brightness distribution of 88 percent. 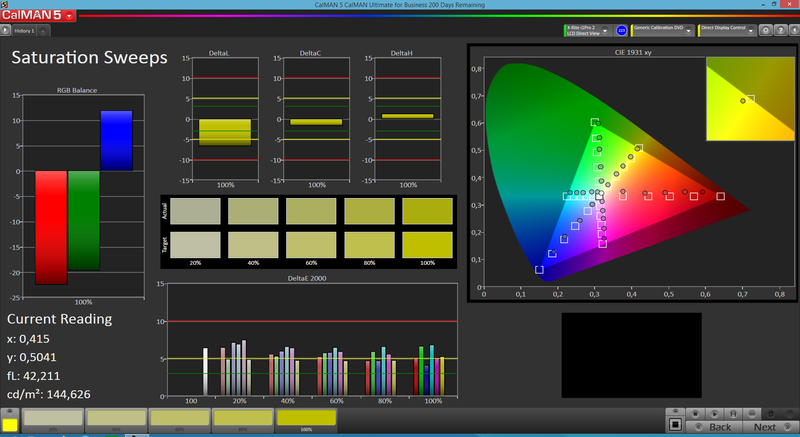 Both the contrast ratio of 637:1 and the black value of 0.59 cd/m² are good as well and result in subjectively vivid colors and rich blacks. 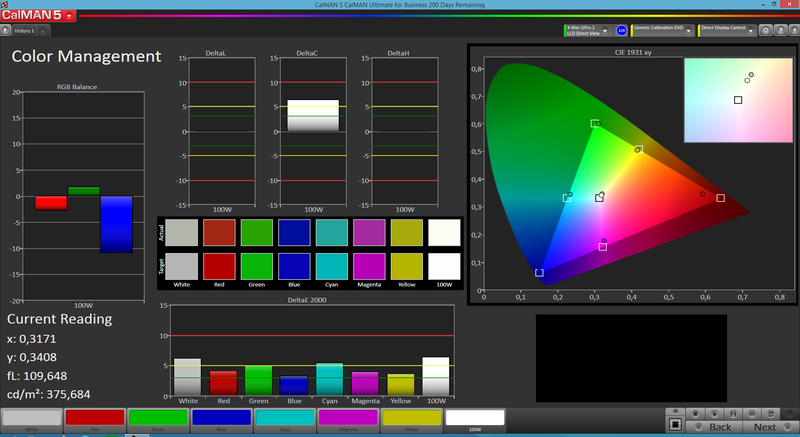 The measurements with the colorimeter X-Rite i1pro 2 and the software CalMAN 5 on the other hand show a different picture: The display of the Asus Memo Pad HD 7 ME176C is too pale in regard to the blue colors, so the ColorChecker deviation in the sRGB color space is not perfect (DeltaE 5.07). 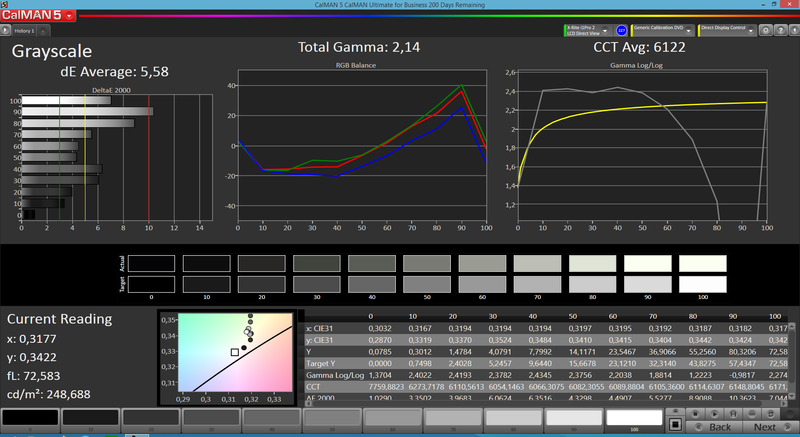 The same applies for the grayscale (DeltaE 5.58): Bright colors in particular are too saturated in this case. The panel brightness of the Asus Memo Pad HD 7 ME176C is easily sufficient to use the tablet outdoors with 353.4 cd/m² on average. Because of the glossy display surface, you can hardly see anything with unfavorable lighting conditions, for example under direct sunlight. A small rotation or tilt of the tablet, however, is usually enough to ensure the visibility. 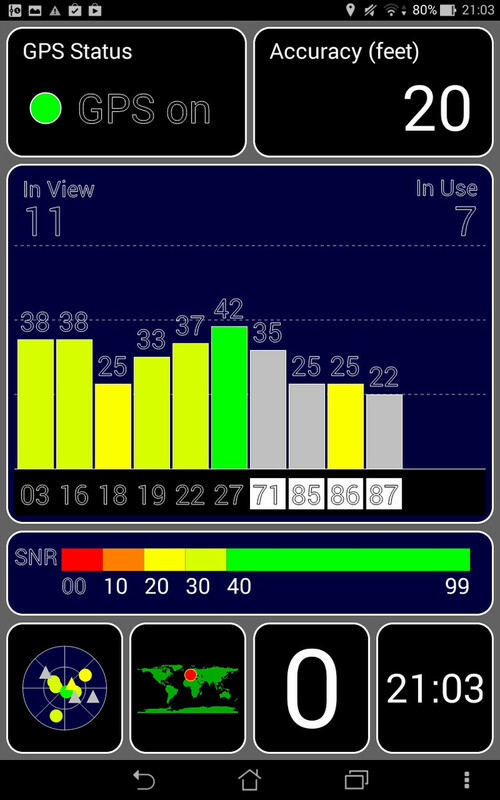 You can use the Memo Pad HD 7 ME176C in the shade almost without restrictions. The IPS display of the Asus Memo Pad HD 7 ME176C shows a high viewing angle stability from every direction. 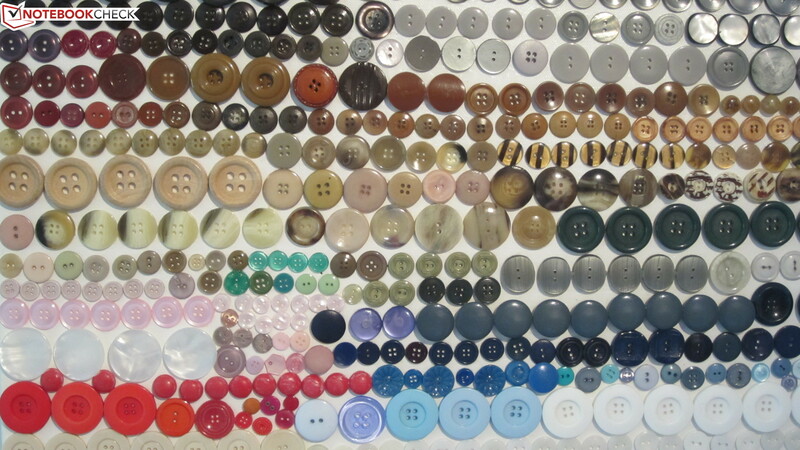 Even very small angles only result in minimal changes of the colors and the brightness. The biggest impact on the readability is the glossy surface anyway. 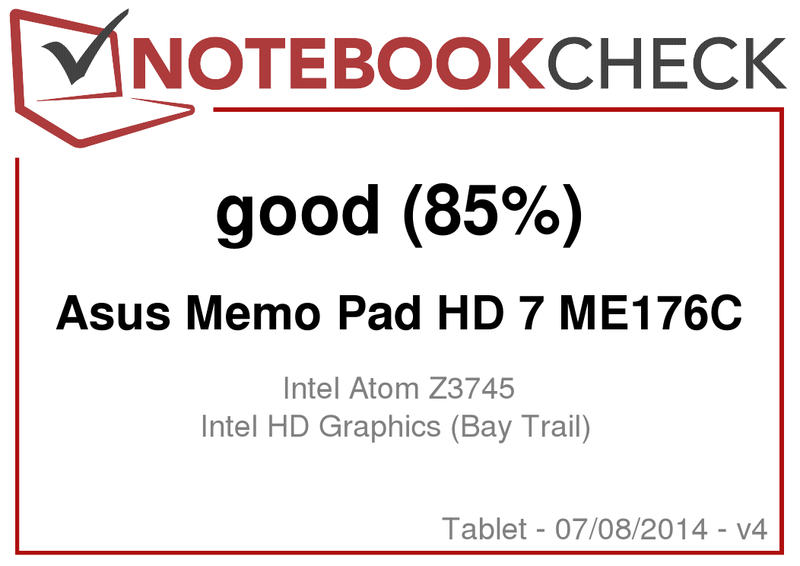 The Asus Memo Pad HD 7 ME176C has a decent performance basis with its quad-core SoC Intel Atom Z3745 and the Intel HD Graphics GPU. 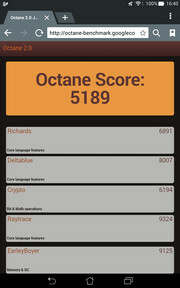 This not only results in a very fast Android experience, but also in very good benchmark results. In the synthetic benchmarks, the Asus tablet is certainly one of the fastest tablets and even sets new records within the comparison in PassMark and Epic Citadel. 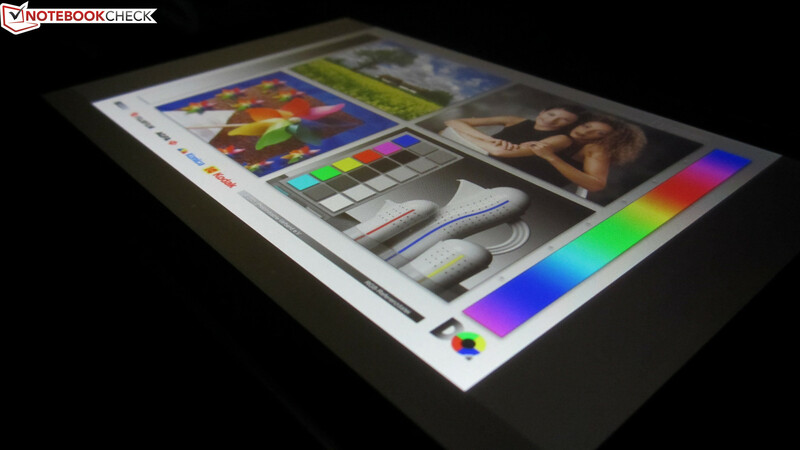 Compared to the predecessor Memo Pad HD 7, the review unit is significantly faster. The HP Slate 8 Pro 7600eg and the LG G Pad 8.3 are a bit faster in total. 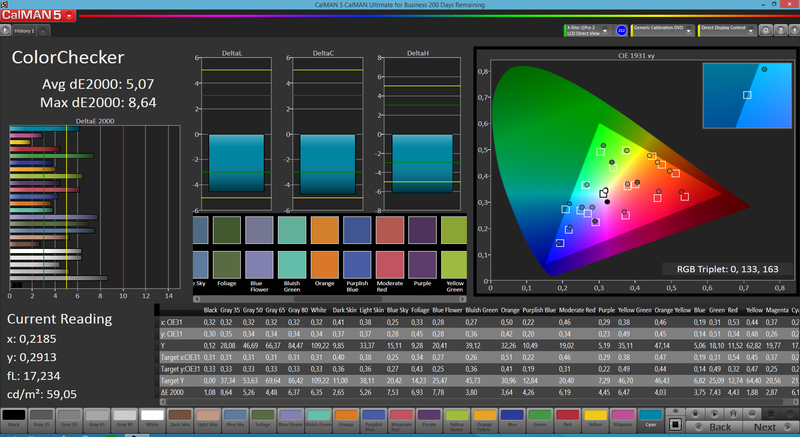 The decent performance is also noticeable in the browser benchmarks, where the review unit is very close to the HP Slate 8 Pro 7600eg, which has a very small advantage in Peacekeeper and Octane V1. However, the Asus is clearly the fastest device in WebXPRT 2013. The other devices cannot keep up in the browser benchmarks – the advantage of the Memo Pad HD 7 ME176C and the HP Slate 8 Pro 7600eg is just too big. 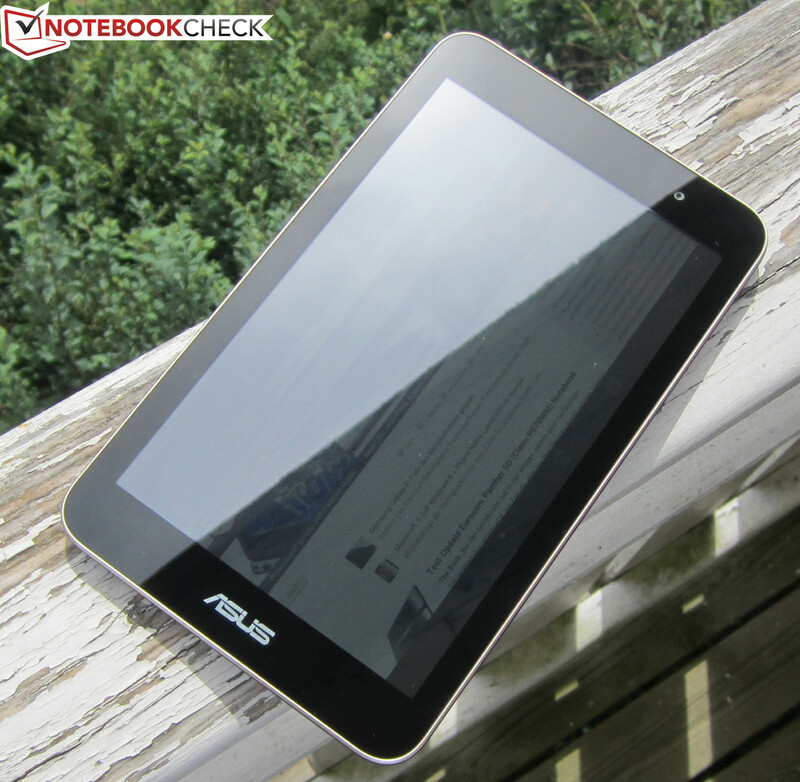 The Asus tablet manages faster read and write operations than the rivals. Sequential and random read accesses in particular are fast on the Memo Pad HD 7 M176C, and none of the competitors can keep up. The advantage is much smaller in terms of writing, but it is still sufficient for first place. Thanks to the CPU/GPU combination, games always run smoothly on the Asus Memo Pad HD 7 M176C. This applies for older or less demanding games like Trials Frontier as well as more complex titles like Dead Trigger 2, which are much more challenging for the hardware. The integrated position and movement sensors of the tablet work perfectly and enable very precise control. Maybe the only drawback is the amount of memory, which is a bit limited being just 1 GB, so there can be long loading times. 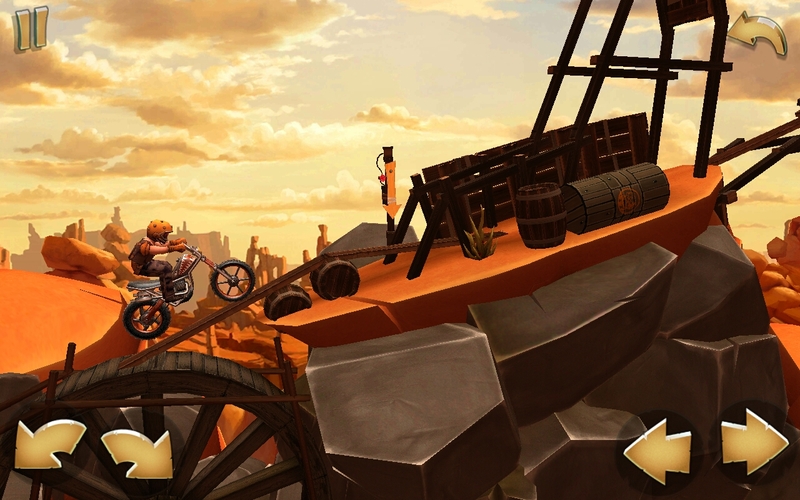 ... or Trials Frontier run smoothly. The use of the frugal Intel SoC Atom Z3745 results in low temperatures during operation. The tablet warms up to 40.5 °C (105 °F) under load, which is just slightly more than lukewarm. It stays much cooler when idle reaching only 32.8 °C (91 °F). (+) The average temperature for the upper side under maximal load is 31.4 °C / 89 F, compared to the average of 30.7 °C / 87 F for the devices in the class Tablet. (+) The maximum temperature on the upper side is 37.6 °C / 100 F, compared to the average of 34.8 °C / 95 F, ranging from 22.2 to 51.8 °C for the class Tablet. The stereo speakers on the back produce a loud, but ultimately powerless sound, which is also somewhat distorted at the maximum volume. Bass is non-existent, and even medium tones are not discernible. Still, the rivals in this price category do not sound much better, either. The 3.5 mm stereo jack can be used to attach headphones to the Memo Pad HD 7 ME176C, which provide a much better sound experience. However, Asus does not include headphones. Thanks to its Intel SoC, the Asus Memo Pad HD 7 ME176C does not only convince with the formerly mentioned low temperatures, but also with a low power consumption in operation, which suggests long battery runtimes. We only measured 2.2 Watts while idling and up to 3.7 Watts under load. These are excellent results within the comparison. The closest rival is still the Asus Memo Pad HD 7, which consumes significantly more power with 5.5 Watts, but it is still one of the most frugal tablets. The most power is consumed by the Samsung Galaxy Tab 3 7.0 SM-T210 with 6.2 Watts and the 8-inch tablet HP Slate 8 Pro with up to 11.8 Watts. The battery runtimes of the Asus tablet are not exceptionally long, despite the low consumption values; they are actually rather standard: The Memo Pad HD 6 ME176C still manages a reasonable 4 hours and 43 minutes under maximum load. 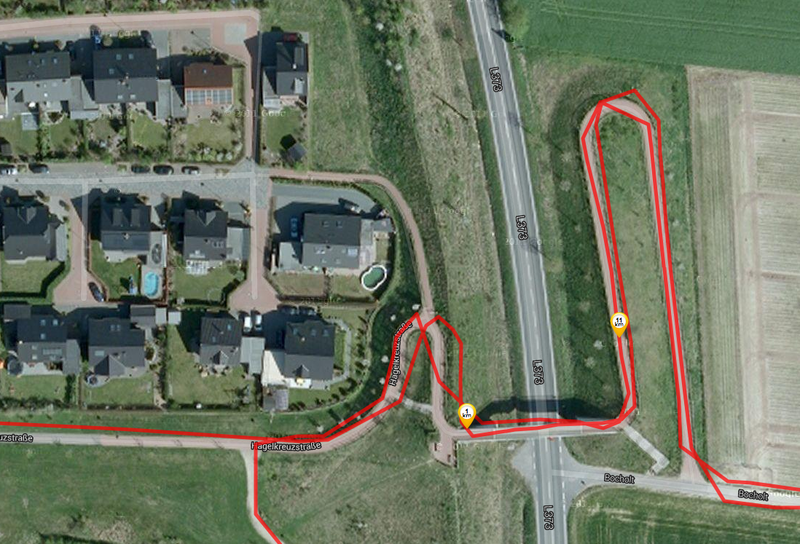 The more realistic WLAN test results in 6 hours and 38 minutes, which is just average. 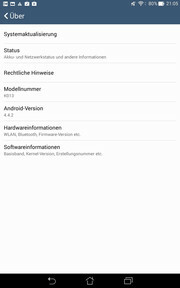 The Asus Memo Pad HD 7 managed slightly better runtimes in both scenarios (4 hours 57 minutes and 7 hours and 44 minutes, respectively). The new version of the Asus Memo Pad HD 7 is once again a convenient package. Even though the Memo Pad HD 7 ME176C only costs around 200 Euros (~$269), it offers more than enough performance for current apps and games under Android 4.4.2 thanks to its powerful quad-core SoC Intel Atom Z3745. The new Memo Pad HD 7 is therefore a good choice if you are looking for an inexpensive secondary device with Android or an inexpensive entry into the world of tablets – it does not matter if you choose the 8 GB version or our review configuration with 16 GB storage. Asus once again saved some money through limiting the memory – it might take a bit longer to load apps and games with just 1 GB RAM. 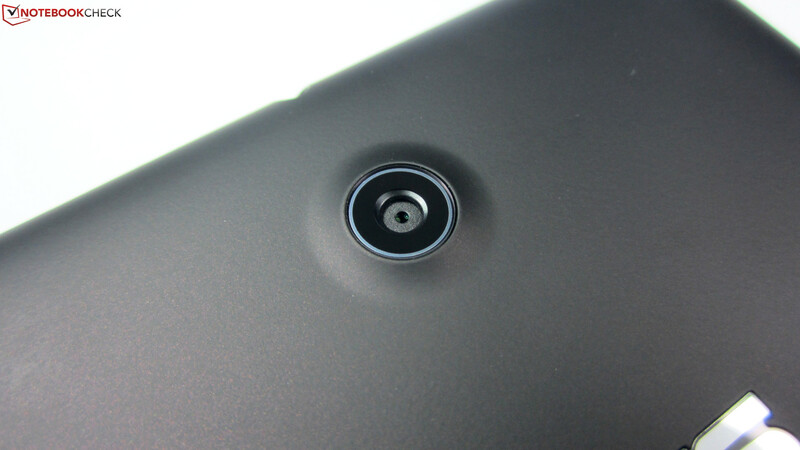 Another drawback is the mediocre picture quality of the integrated camera modules. 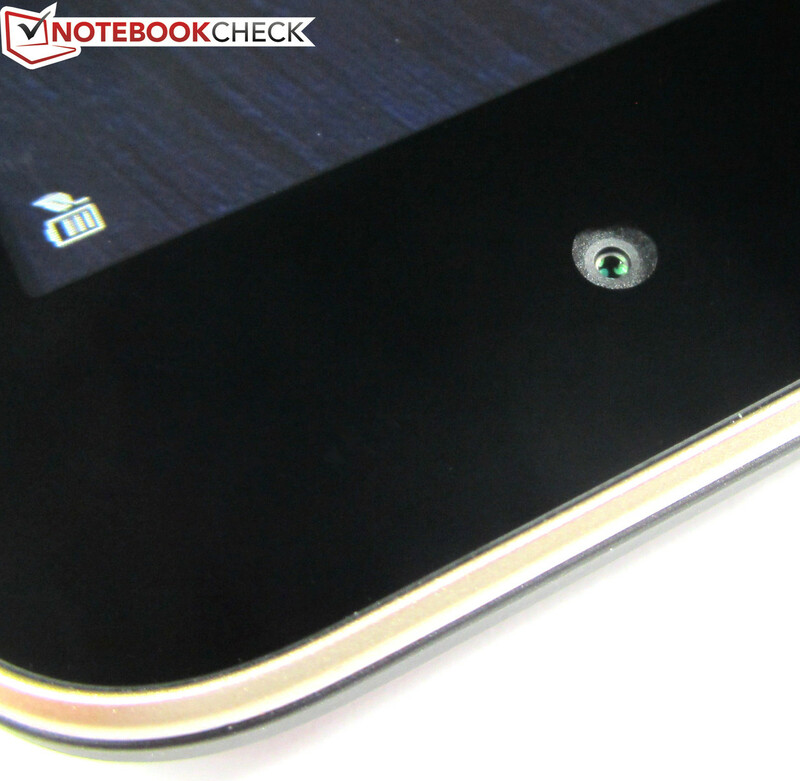 In Review: Asus Memo Pad HD 7 ME176C. Review unit courtesy of Notebooksbilliger. 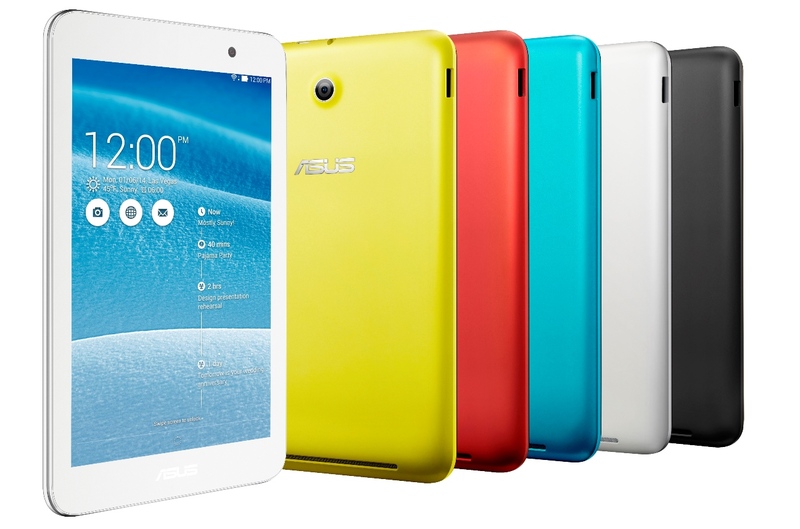 7 inches, quad-core SoC, 200 Euros price tag: The Asus Memo Pad HD 7 ME176C. 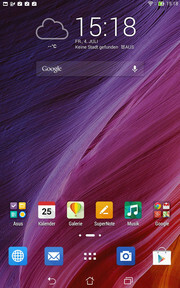 The display of the Asus Memo Pad HD 7 ME176C has a resolution of 1280x800 pixels. Besides black, you can also get white, yellow, red or blue cases. The back of the Asus tablet is made of matte and slightly rubberized plastic. The stereo speakers are at the back as well. The 5 MP main camera takes pictures with up to 2560x1920 pixels. 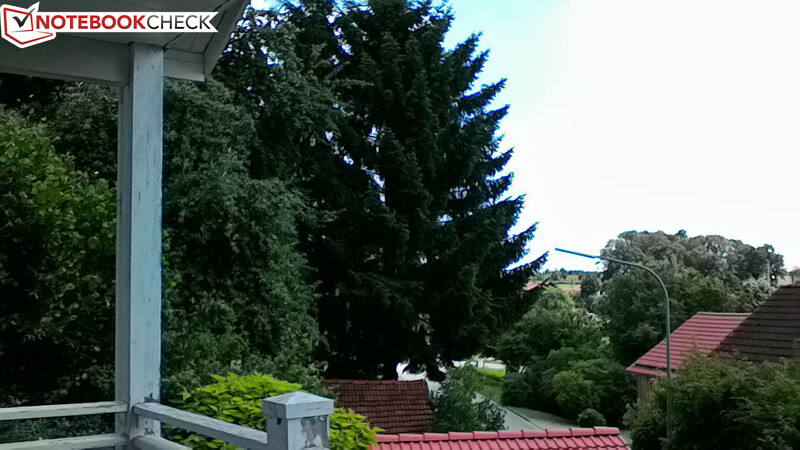 The webcam has a 2 MP sensor (1600x1200 pixels). 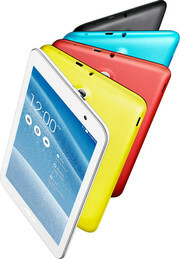 A plastic frame with a metallic design surrounds the 7-inch tablet. ... a micro USB cable, a modular power adaptor as well as a quick start guide. 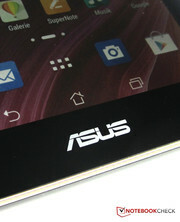 Asus equipped the Android tablet with its user interface ZenUI. 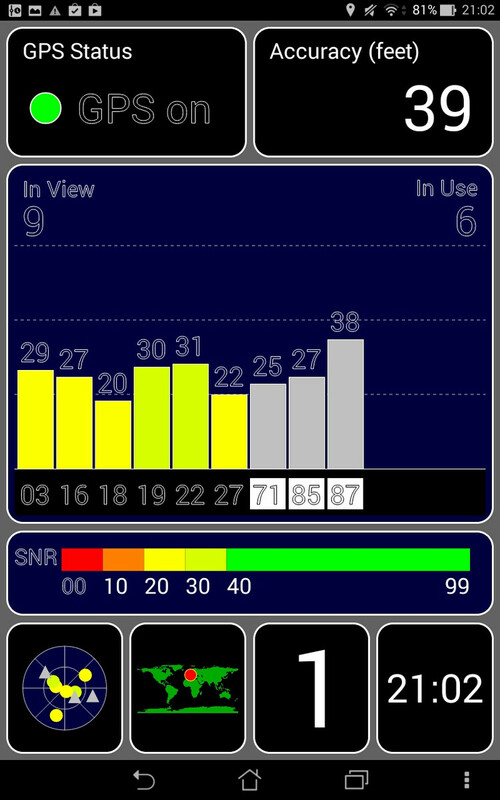 Numerous widgets can be placed on the user interface. The tablet battery manages 4 hours and 43 minutes under maximum load. 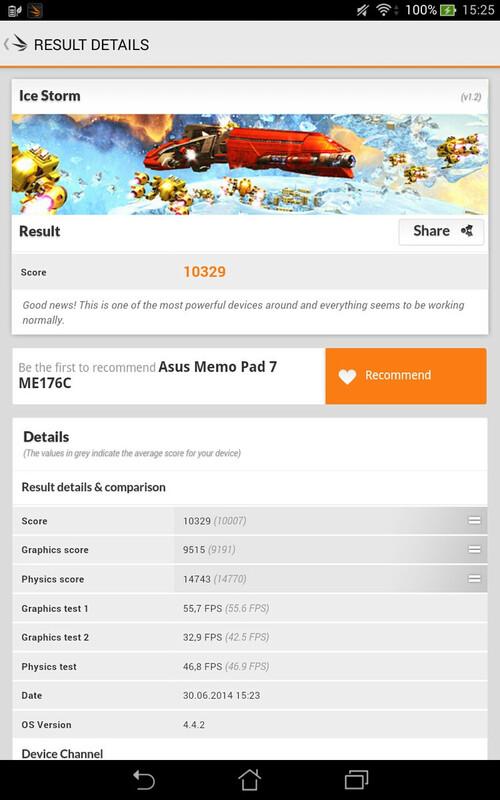 Synthetic benchmarks like the 3DMark 2013 show a high performance for the Asus tablet. 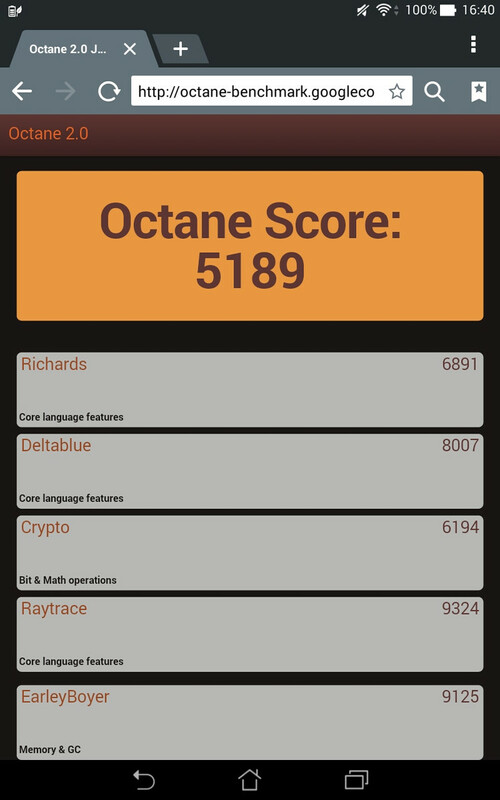 The same applies for the browser benchmarks (in this case Octane 2.0). 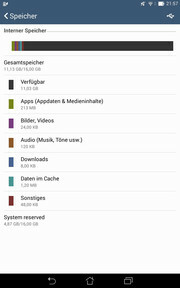 Users can use around 11 GB of the 16 GB storage. The Asus Memo Pad HD 7 ME176C runs with Android 4.4.2. The Asus Memo Pad HD 7 ME176C is inexpensive, fast and offers a lot of free storage in the 16 GB configuration. A better camera module and a flash, especially when you consider the convenient camera settings. You get a fast 7-inch tablet for less than 200 Euros, which has no real drawbacks. 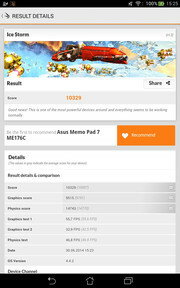 The Asus Memo Pad HD 7 ME176C is certainly a recommendation for the practice.